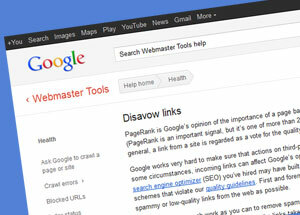 As we have previously discussed, Google recently launched a Disavow Links Tool. Using this tool, bloggers and webmasters can 'disavow', or disinherit some selected incoming links to their websites, so that Google won't consider those links when evaluating the website. The idea is to prevent spam-backlinking, that can bring down a website's ranking, because Google considers the quality of the backlinks to a website more than the quantity, and hence penalizes for bad or spam linking. So for any malicious websites trying to link to your site, their links can easily be disregarded. But before you go on disavowing every link that looks suspicious to you, there are a few things you should be mindful of first. Some people might be too lazy to remove the bad links to their website by hand. Well, unfortunately, this tool isn't for them. The disavow tool isn't a shortcut. Google's Matt Cutts warns that this tool should be used with caution. So before scraping out a text file with the bad links on it, take your time and think of a few things beforehand. We discussed this in our previous post as well, but I'll mention it here again anyway. Google penalizes a website that has bad links pointing to it. If your website has been penalized, you will know from the messages you'll receive in your Webmaster Tools dashboard. Otherwise, a random drop in traffic due to another reason such as server problems, redirections, broken links, or something like a site-wide noindex (by mistake) can be easily confused with a penalty. So much so that in more than half such cases, people think they've penalized, when they actually haven't. So before you jump to conclusions and start getting rid of your links, please first determine whether you've been actually penalized or not. Are the links really hurting you? This is another important. Are those links really hurting you? There's not much by way of knowing what links are good for you, and what are bad. You might find the bad ones indicated by Google in Webmaster Tools. So bide your time, and let Google identify the bad links for you or you might just end up axing your own feet. Another concern that this tool raises is that Google now gets more power over your website (not that it doesn't already have a lot). It doesn't say so, but Google could develop something against a site that submits a lot of links to be disavowed, since it hints at a shady past. Also, who knows whether your site will be flagged when some other site disavows links from your site? Once you submit a list of all the links you want to disavow, it will take some time for Google to act upon your submission. So you'll have to be careful the first time. And if you make a mistake, it'll take days, maybe weeks to rectify that mistake. So only make submission when you're really sure about what you're doing.